an interesting meteor disaster movie that is much better in it’s first half which is more of a coverup / conspiracy story, then in it’s second half, which becomes more routine. a pretty decent meteor heading towards earth movie that turns out to be one of the better of the movies from the disaster craze of hollywood films. this one is smarter than most in the way that it divides up it’s narrative into three different stories, telling the same disaster situation from different points of view. we start out with the reporter who uncovers the story, then move onto the kids and citizens who are dealing with it from the average person’s point of view. finally we spend time with the astronauts who are on the mission to destroy the asteroid. the movie does get silly and ridiculous at times, but overall the three different storylines really help propel it along. Deep Impact is an asteroid movie from that time in the nineties when disaster movies were the big craze. it all really started with twister in 1996. Then there were the two volcano movies, dante’s peak and volcano. And then there were the two asteroid movies, Deep Impact and armageddon. those two movies were at the height of the craze. and probably the best two of the bunch. by the time it was over, director roland emmerich (who was making independence day during the time of these other films), was trying to get in on it with movies like the day after tomorrow and 2012. Only the appeal of these types of movies was long gone. luckily when Deep Impact was put together, there were still interesting stories left to tell. 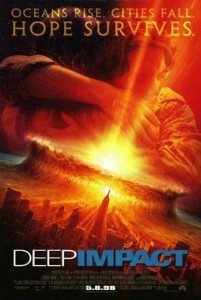 Deep Impact is the lower budget (if you can even call it that), more grounded asteroid movie, as opposed to armageddon, the big goofy michael bay version. bay’s movie is the pure action film whereas Deep Impact is more driven by story. that’s why the first thirty minutes or so of Deep Impact don’t even mention the asteroid, but instead are about a conspiracy-like secret being uncovered. 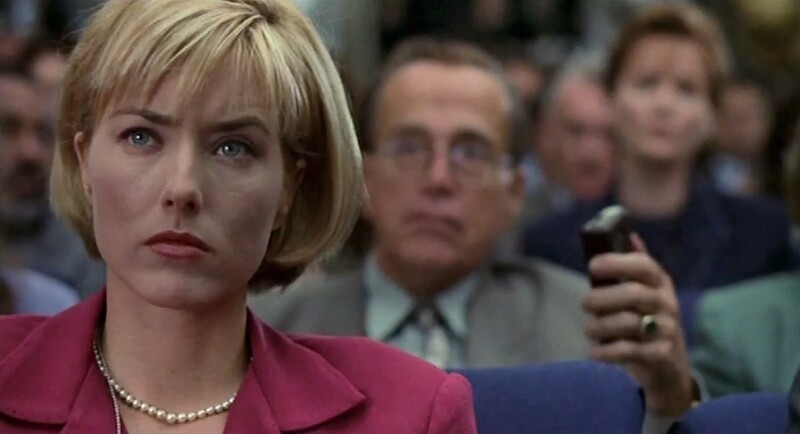 the main character of the movie is jenny lerner (played by tea leoni, an actress who always looks like she’s crying.) How she got cast as the star of this film is anyone’s guess when she had such limited movie experience before it, including bay’s bad boys, where she had a limited role. but here, she leads an all star cast including robert duvall, morgan freeman, James cromwell, john favreau, blair underwood, and elijah wood. her character, lerner, is a news reporter trying to uncover a story. that story is about a white house aide, alan rittenhouse, (james cromwell), who is retiring, and a possible mistress who he was seeing, being the reason for the retirement. lerner interviews rittenhouse’s former secretary who tells her about the secret calls he was taking and a name that she overheard being repeated. ellie. lerner thinks this must be the name of rittenhouse’s mistress and so she goes and finds rittenhouse to confront him. when she finds him, rittenhouse is packing up a boat with his family and about to sail off to sea. lerner doesn’t get many answers, and instead more questions are raised. as she leaves the docks and drives off, being more confused than she was before the confrontation, she is surrounded by a bunch of black sedans that cut her off and take her in. Lerner has no idea what’s going on or who these men are, or where she is being taken, but the next thing she knows, she is in a basement kitchen standing face to face with the president of the united states. that would be morgan freeman, who plays the part pretty well. just like lerner’s confrontation with rittenhouse on the docks, her talk with the president now has the president assume that she knows everything. lerner, of course, doesn’t really have a clue. she still thinks this whole thing is about a mistress, and the fact that nobody ever asks her what she really knows is a little ridiculous. instead, they just tell her more, and this time they let her know the truth. a meteor is headed for earth and the public is not being told about it until a decision is made about what to do. at this point, the focus of the movie switches over to other characters, and that’s a very good move. we have run with the lerner story for about as far as it can go. lerner is still in the movie, appearing every now and again to have scenes with her divorced parents, but the meteor story is no longer about her. instead, there are two other sets of characters who now take center stage. the first is elijah wood and the girl he likes, played by leelee sobieski. Wood plays leo biederman, a kid who actually discovered the asteroid while looking through a telescope in his astronomy class. he told his teacher and his teacher called it in, and then his teacher mysteriously died. so did the guy who recieved the photos and figured out what it all meant (although that guy’s death wasn’t mysterious, and we got to see the car accident that resulted in it.) now, the meteor has been named after biederman and he and his girlfriend are trying to get themselves and their families into a bunker for safety. the elijah wood story is the human side of the movie. they and their parents are the regular citizens who deal with a sort of lottery where people are randomly selected to come and live in a bunker for two years until the air is safe to breathe again. while his story gets a little silly towards the end, and involves riding a motorcycle around like an action hero, there is also another story to keep us hooked. that is the story of the astronauts who are taking a rocket ship up to space to try to blow the asteroid up. there’s a crew of five and they are highly trained and ready to go. i like the way that the movie spends time getting to know these characters a little, and what they are all about. for example, we get to hear how the four younger astronauts feel about having robert duvall with them, a hero who is from their parent’s time, and hasn’t really trained with them at all. he’s the public face of the operation. Deep Impact works because it takes the time to give us little stories like this. the astronauts make up only one-third of the stories in this movie. in armageddon, by contrast, those astronaughts were the entire movie. Deep Impact does have plenty going on that feels silly, corny, or just ridiculous, but the way it handles storytelling definitely holds are attention and keeps us interested. the idea of separating the movie out into three different stories really goes a long way.